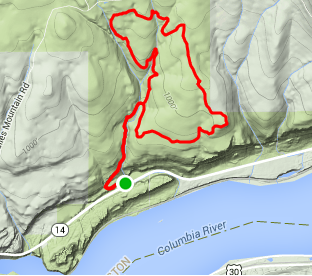 Most Columbia Gorge mountain biking takes place in the forest. But not this trail. Oh no. There’s nary a tree to shade your helmet. Ok, that’s an exaggeration. There are a few scruffy oak trees, but most of this ride takes place on a grassy plain. Or if you time it right, the ride takes place in an endless meadow of wildflowers. Park your car at the Crawford Oaks trailhead at Columbia Hills State Park. This trailhead is about 1/2 mile east of Horsethief Butte, which is itself 1/2 mile east of Horsethief Lake. Climb up an old road for about .7 miles, and then take a right onto the trail. It’s well signed. You won’t miss it. You’ll cross a creek, and you can either go right or left to ride the Vista Loop. I prefer riding it clockwise, so if you want to be like me, go left at the T intersection. The trail climbs for a mile or so, then traverses flat meadows, then descends back to the T-intersection. You can skip that “military road” down the middle. If you’re going out there, bring lots of friends. The trail was never cut down to the dirt in most places and could benefit from a lot of bike traffic. Other advice: only ride this trail on a calm day. Both the east and west wind whips across the open plain. One more piece of advice: ride this trail in the spring when the wildflowers are blooming. You won’t be disappointed. Counterclockwise elevation profile. Read this from right to left for the (better) clockwise version.